related portals: Mystery, Children's literature. A crime novel set largely on Dartmoor. At the time of researching the novel, Conan Doyle was a General Practitioner in Plymouth, and thus was able to explore the moor and accurately capture its mood and feel. 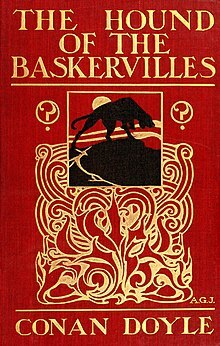 In the novel, the detective Sherlock Holmes and his assistant Dr. Watson are called to investigate the mysterious death of a wealthy Dartmoor resident whose death appears to be connected with the curse of a legendary, monstrous hound of supernatural origin. THE SHADOW OF SHERLOCK HOLMES. "MICAH CLARKE," "THE WHITE COMPANY," "RODNEY STONE,"
It was to your account of a West-Country legend that this tale owes its inception. For this and for your help in the details all thanks.